Start the New Year with Half Price Carpet Cleaning! Make a clean start this year. 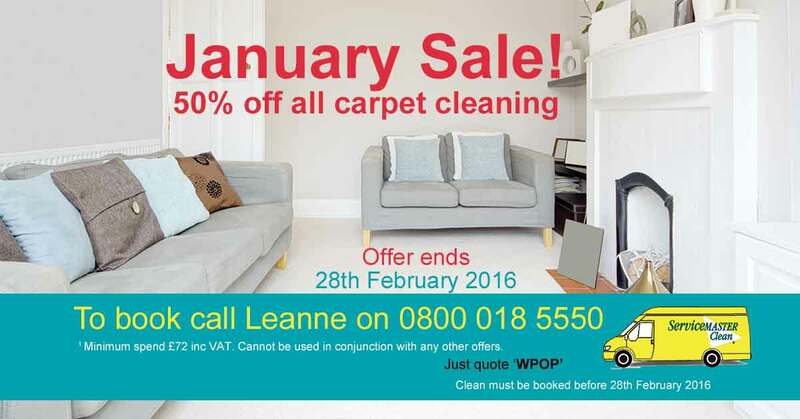 We have a great new offer for you for 2016 – half price carpet cleaning! Just book our expert cleaners to visit your home to clean your carpets and save 50% off the bill. To take advantage of our New Year half price carpet cleaning offer just call us now on 0800 018 5550 and quote the discount code ‘WPOP’. And you don’t need to have your carpets cleaned in January. The offer runs until the end of February but you will need to book up soon as appointments are filling up fast. As a customer of ServiceMaster Clean Devon we have a raneg of offers for our customers so do join our mailing list to keep up to date or just visit us on Facebook. For the full details of the offer and to book an appointment call us now. If you need any other cleaning services just ask our team how we can help clean more than just your carpets at your home or office. We provide carpet cleaning, curtain, sofa and upholstery cleaning to both residential and commercial customers. * Subject to minimum spend of £72 inc VAT. Cannot be used in conjunction with another offer.